Marvelous Monday in 2016 posts once a month, on the second Monday of the month. The following is a new weekly post on I’m Jeffrey Rex, wherein Jeffrey predicts the coming weekend numbers at the box office for North America. Fantastic Four is the updated Marvel Comics origin story about its First Family – the Storm-siblings, the incredibly intelligent Reed Richards, and the strong-willed Ben Grimm. Together they team up to defend Earth and its citizens. But before becoming a team, they changed in more ways than one. Does the newest 20th Century Fox superhero film live up to its title? Sadly, no. However, it did start quite well. 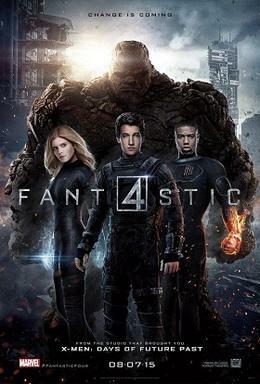 This film is loosely based on the 2004 Marvel Comics reboot, Ultimate Fantastic Four, and you definitely see its roots if you’re familiar with the ‘source material.’ Reed Richards is a child prodigy, who is ultimately invited to study and work in the Baxter Building, and he is aided by his good friend, Ben Grimm, who, in spite of his involvement in Reed’s school project, has no real attachment to the Baxter Building. In fact, I loved this part. There was a certain Batman Begins-feel to the film, and everything worked for quite a while. There can be no doubt, the best character in this film is Reed Richards – as he should be. Also, while I was afraid of what tone Fox was going with, I was pleasantly surprised to see that the film was less grim than the trailer made it out to be. It is not that the film was perfect for the first hour, or so, but it ran rather smoothly. Sure, the dialogue was a bit wonky and cheesy at times – but it didn’t really hurt the film in its first half. But then things started to fall apart. I can tell you that there is a handful of comic book movie sins in this film – but no sin is bigger than the one they commit at its halfway point. Reed Richards’ reasoning for using the Quantum Gate is extremely dodgy and out of character. After having reached the point of no return, you start to notice the film’s clear errors. The look of the ‘other dimension’ is not done well, Kate Mara is wearing what looks to be a wig for half of her scenes, and the pacing is awful. When I started to think about the villain, then the film started to be upsetting. Victor Von Doom (Not ‘Domashev’; apparently, they chose to keep the original name after fan backlash) is obviously the villain. And I’m not just saying that because I know of the comic books. The film hits you over the head with the obvious fact that Toby Kebbell’s character is the villain. He is referred to as ‘Dr. Doom’ sarcastically – as well as ‘Adolf’ (no, I’m not kidding). Sadly, Doom is a forgettable character and his look is awful. Doom should not look like a silver-and-green mannequin. Josh Trank, Simon Kinberg, and Jeremy Slater had a great plan for this film, but while they handled Mr. Fantastic and the first half of the film amazingly, they ultimately fall short. In the end, the pacing of the final act is what kills this film. The big battle is rushed, the villain is wasted, and Marvel’s First Family doesn’t really live up to any of its name. An awful reboot for the Fantastic Four. Final Score: 4.9 out of 10 – Though promising at first, Fantastic Four completely falls apart in the poorly paced final act.